When I was younger, I had a fear of makeup counters: The bright lights above the glass counters that made me feel more exposed, the intimidating line of products that promised to make me more beautiful, the judgment I felt as the makeup ladies approached me. See, while other kids were worrying about acne flare-ups, my concerns were slightly more peculiar. I was born with head-to-toe eczema and a condition called cholinergic urticaria, a fancy, scientific term that means my body reacted with hives when exposed to sweat. My rash breakouts were wildly unpredictable and could be triggered by several heat-raising activities: Jogging or gym class workouts were obvious, but also hot baths or showers, over-exposure to sunlight, and even emotional stress would mean I'd wake up to a redder, more inflamed face the next morning. All of this made it really hard to get into makeup. I was anxious that covering my skin with foundation or cream blush might trap moisture and trigger a sweat sesh. Sometimes I'd feel a tinge of resentment watching my friends apply cool, new products—I wanted so badly to experiment with them. It all started when I walked by a beauty counter and came across a product advertised as "pH balancing." To me, pH was for science experiments (my dad's a scientist; I've heard him mention it a time or two, but knew nothing about what it meant). So, I went home, conducted a little research project and surprisingly discovered a link to my angry skin condition. To put it simply, pH, based on a scale of 0 to 14, describes the acid-alkaline ratio of a substance. Skin's pH is created when its protective layer (the acid mantle) excretes fatty acids from the skin's sebaceous glands, which then mixes with lactic and amino acids from sweat, determining your individual level. To work optimally (AKA keep moisture and lipids in, and toxins and bacteria out), the acid mantle should be slightly acidic—anywhere from a 4.5 to a 5.5, says Gary Goldenberg, M.D., a medical and cosmetic dermatologist in New York City. Too alkaline (a pH around 10 or higher) and skin becomes dry and sensitive, which can lead to eczema and a slew of other skin disorders. That's what happened when I would sweat: my skin's acidity level would be thrown off, prompting an immediate hive breakout. Basically, your skin's pH level is like a crystal ball for your face: it shows and tells you what's going on, good or bad. "With eczema, the acid mantle, or barrier, is thrown off and inflammation occurs, triggering a flare-up," Dr. Goldenberg says. And that's where pH-balanced products come in. They bring the skin's pH down to a normal level, repairing the barrier, explains Dr. Goldenberg. My levels were clearly off, so I made it my mission—along with the help of my derm— to find some balance. For starters, I did some product research (I ran everything past my derm, don't worry) and looked for things, like cleansers, that had the term "pH optimized" printed on the label. I also used litmus papers (available online) to test the exact levels in the formulas I was using—you dip the strips inside the product to test the color (red = acidic; blue = alkaline). If you don't have litmus papers on hand (I mean, why would you? ), pay attention to what your skin is trying to tell you: if you notice your complexion changing, its pH has probably been knocked off kilter. "Even factors like the food you eat and the temperature of shower water can throw it off," according to Dr. Schlessinger. Aside from specifically labeled cleansers, I was also prescribed steroid creams from my derm, and started hydrating my skin with simple moisturizers that did not contain irritating fragrance. It wasn't until I followed a strict skincare regimen that my skin started to completely heal. 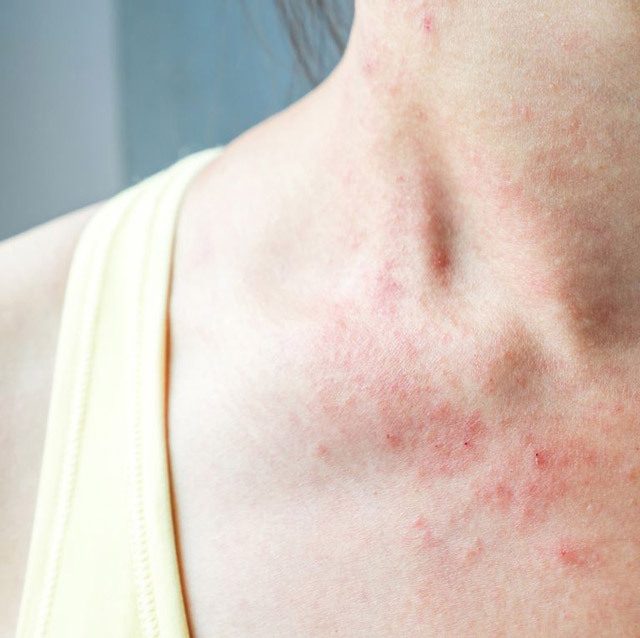 If you've ever suffered from a skin disorder, you know that everything—the triggers and treatment, as well as the appearance of the rash itself—weighs heavily on your physical and mental health. And the road to resolving it is filled with a lot of lows (the anxiety that comes with the thought of wearing short-sleeved shirts) and highs (the incredibly good feeling of relief that comes with watching those red spots disappear—and, for me, finally being able to wear foundation fearlessly). For a long time, I resented beauty because I only saw it as a way to mask my imperfections. Now I operate with a new philosophy: There is no shame in using makeup, and there’s no need to be afraid of it if you don’t have perfect skin.